Gerald Clayton “has proved himself one of the standout jazz pianists of his generation, possessed of silvery technique and an intent but relaxed way with a phrase” (The New York Times). This young jazz master grew up playing with his father John Clayton and uncle Jeff Clayton in their Clayton Brothers combo. He’s since forged his own path, leading his eponymous multi-GRAMMY-nominated trio and holding down the piano chair in Charles Lloyd’s quartet. Duke Performances, Modlin Center for the Arts at University of Richmond, Savannah Music Festival, and Strathmore have commissioned Clayton to make Piedmont Blues: A Search for Salvation, a sprawling live concert tribute to the Piedmont blues — a musical style defined by ragtime rhythms, fingerpicking guitar, and understated vocals twinned with searing lyrics — that grew up around the tobacco warehouses of Durham, North Carolina in the 1920s and '30s, when the Bull City was the largest cigarette manufacturer in the world. Though the most famous exponents of the Piedmont blues — Blind Boy Fuller, Reverend Gary Davis, and Etta Baker — have passed, a few musicians still keep the tradition alive. Clayton and his collaborator, theater director Christopher McElroen, have made a half-dozen research visits to Durham to learn from and work alongside these musical elders in preparation for this major new show. 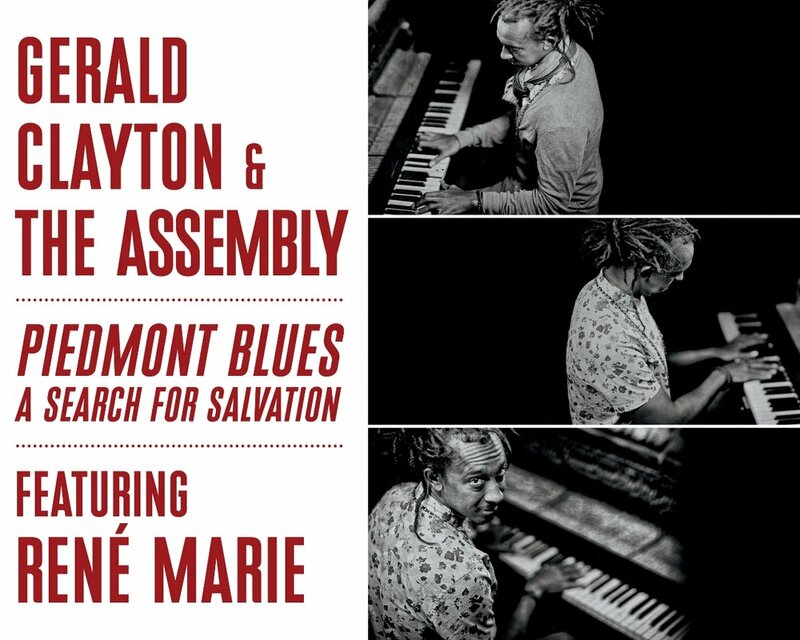 This live concert presentation features Clayton’s Piedmont blues-inspired compositions written for The Assembly, a top-tier nine-piece jazz ensemble featuring the GRAMMY-nominated singer and Piedmont native René Marie, who has been called "masterful" by DownBeat and "hip and swinging" by The Wall Street Journal. Entwined with the music is an assemblage of projected film, new and archival photography, and Southern folklore underscoring the verdant cultural landscape of the Piedmont region.